We have apparently reached that stage in the development of the electronic cigarette where it is difficult to create a device that stands apart from the crowd and just as difficult to find a new name. With the eVic, Joyetech has found some unoccupied territory as far as design is concerned, but has perhaps had to stretch a little to come up with a unique name for its new advanced personal vaporizer (APV). The “Vic” in eVic stands for “Vapor Intelligent Cigarette” and presumably the “e” is for “electronic.” It is considerably more “intelligent” than other devices on the market, thanks to its compact little screen and that it can interact with a computer software program via USB. More on that later. 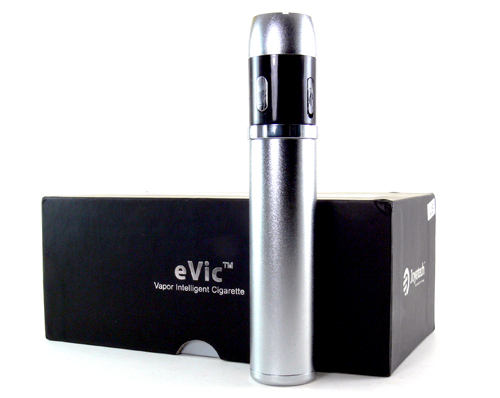 The eVic measures 124mm long, comparable in length to the ZMAX or Lavatube. Its 24mm diameter is 1mm wider than the Lavatube and 2mm wider than the ZMAX. At just over 4 ounces including the battery, it’s right in the middle of the pack in weight as well. These details add up to a device that is well proportioned, if maybe just a little chunky in appearance. The latter may have as much to do with the brushed aluminum finish as it does with the actual millimeter or two of added width. It is quite comfortable to hold and use and easy enough to throw in a pocket or purse. Individual detachable components make up the body of the eVic. The battery tube unscrews from the control head and has a bottom cap that unscrews as well. The wide ring around the atomizer connector also unscrews from the control head, leaving the Ego connector completely exposed. There are few, if any devices that are designed this way, but it makes a lot of sense. By removing the ring, the area inside where juice collects can be easily cleaned. Individual pieces would also be easily replaceable and Heaven-Gifts now has the control head alone available for $79.99 along with the other components. The design does make one wonder if Joyetech has further plans for customization. Color and style variations by simply changing out the tube and ring, perhaps? How about a dedicated tank? Maybe an 18350 model? The ring and eGo connector on the eVic deserve kudos. The connector is a full eGo design, including the outside threads, meaning that it can be used with eGo cones and other accessories. The interior threads are 510 compatible, so it will work with all of those atomizers and cartomizers as well. The ring has a wide opening, allowing for the use of some of the wider clearomizers that are on the market. The top of the ring has four slots cut into it, providing adequate airflow for use with tanks. There are a number of safety features built into the eVic. The bottom cap has a the requisite center hole for venting in case of catastrophic battery failure. Short circuit, low voltage, overheating and reverse polarity protection are also built in. The device can also be easily turned off or placed in standby mode, either manually or after a timeout that we’ll discuss in a moment. Another unique feature of the eVic is the control design. At first glance, there appears to be only one button, an elongated oval button opposite the screen. This button activates the device and five rapid presses enter the menu system and also turn the device on from sleep mode. Other functions are controlled via a unique center spring loaded ring that twists right and left. Twisting it adjusts the voltage by .1 volt increments and also allows for navigation up and down through the menu system when in that mode. The biggest innovation on the eVic is the display. Rather than the simple 3 digit LED that we’ve seen on a lot of electronic cigarette devices, the eVic has a multi-line readout. During normal use, it shows the number of puffs taken since the last reset, the number of puffs remaining, a numeric and graphical representation of the remaining battery life and the current output voltage. Up and down arrows also indicate that the corresponding functions of the twist ring. Five quick presses of the fire button access a menu in which a variety of settings are available, including sleep and power off, standby timeouts, atomizer ohms, power settings, calendar settings and puff count settings. The twist ring is used to navigate up and down and the activation button to enter the selected choice. Of course, navigating a menu system with only three buttons is a little cumbersome, but that is to be expected. The standby feature sets timeouts for the screen to turn off to save power and for the device itself to turn off for safety. This feature is either convenient or irritating, depending on how you look at it. It lessens the likelihood of unintended pocket fires, but also means that the device will sometimes be in standby when taking a quick puff. Luckily the timeout can be set anywhere from 3 minutes to an hour, so most users will be able to find a good balance between safety and convenience. The calendar is another neat feature that is possibly too inconvenient to be truly useful. It shows the date and time, but takes a combination of 11 button presses to access, making it unlikely to replace your watch. The atomizer ohm test also takes 11 presses to access, but that actually seems pretty acceptable for the number of times that information will need to be accessed. 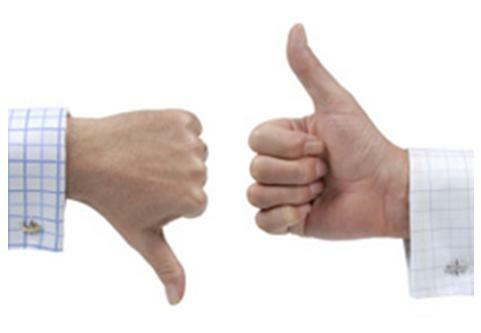 That’s right, we’re going to discuss software in the review of an electronic cigarette. 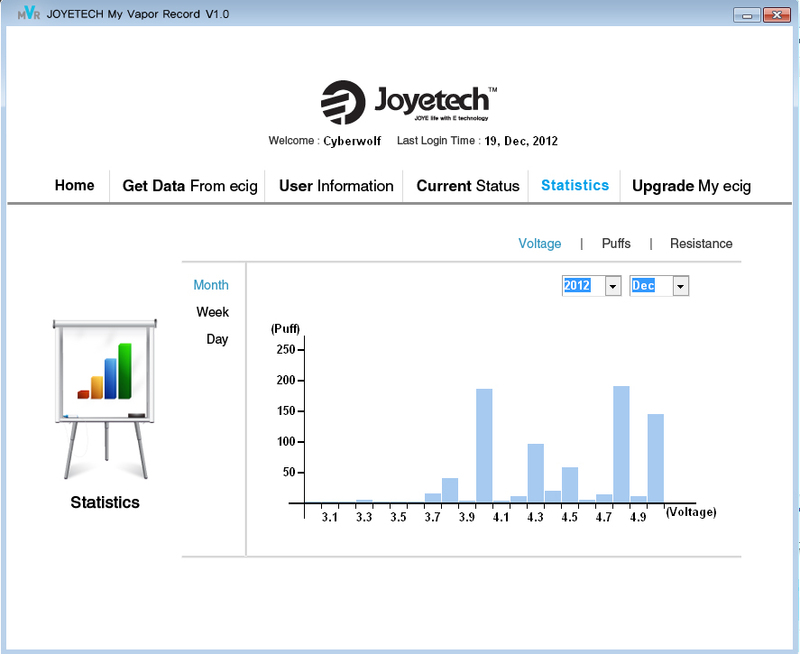 My Vapor Record (MVR) is a small program that is available for download from Joyetech that allows the eVic to connect and upload information regarding vaping habits to a PC. The program provides some interesting information regarding voltage, puffs and resistance settings that have been used on the device. The interesting thing is that the device retains a historical record of usage and the MVR program graphs it over time. The interface also allows you to input a name into the device, but like the calendar, it takes a number of button clicks to get to that information. I’d find it a lot cooler if the display alternated between voltage settings, calendar and “Cyberwolf” while in use! There is also an option for upgrading the device and it will be interesting to see what that brings in the future. Voltage output is pretty good, but does not quite live up to the marketing. The unit seems to be able to produce about 10 watts of power, a little shy of the advertised 15 watts. edit: Since this article was written, Joyetech has changed the marketing information to 11W, which is more in line with actual performance. The device appears to have an limit of less than 3 amps, which is a little low for a device in this range. Using a 1.6ohm cartomizer, the eVic functioned flawlessly up to 4 volts or so. Any setting beyond that still produced about 4 volts. With a 2.6 ohm cartomizer the unit outputs the maximum 5 volts. In either case, voltage is consistent, but likely to be a little disappointing to vapers looking for higher voltage. The variable power feature is a little less functional on the eVic than on some other devices we’ve tested. The eVic does allow the user to set the power by going to the Menu > Power Set > Output and there the power can be adjusted up to 15 watts. This setting adjusts the voltage to match the resistance of the atomizer currently on the unit, but it is not automatically adjusted when a different resistance atomizer is installed. The menu must be accessed again to set the power output for the new atomizer. After the power is set, the voltage can also be modified with the rotating ring. The eVic seems to be designed to provide a suggested voltage based on the desired power output rather than a true variable power mode like the ZMAX or Darwin. It’s still very helpful, but we would rather have a variable power mode that automatically matches whatever atomizer is attached. 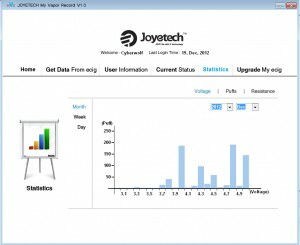 edit: Joyetech has made the first update available and it fixes the issue we just mentioned. 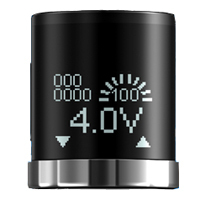 v1.1 of the eVic software, which is easily downloaded and installed to the device via USB, adds a full variable wattage mode to the device. If there was any question whether the update feature was worth it, there isn’t any more! Battery life is very good, thanks to the 18650 battery capacity. A couple of days on a charge is easily reached with moderate vaping. A slight reduction in performance is evident as the battery drops to around 50% charge. Recharging is very convenient thanks to the possibility of charging both by the included USB cable or by charging the battery on an external charger. It’s nice to have choices and the eVic from Joyetech gives us yet another choice in variable voltage APVs. This device provides a combination of features and design that have not been seen in electronic cigarettes to this point. The automatic standby and shutoff features make it a great device to carry in a pocket or purse and the design ensures that it will work well with a wide variety of attachments. The display and software interaction are not enough to make this device a must-have, but do provide a wealth of information about vaping habits and device usage. Power output is adequate, if a little disappointing. The 5 volt limit is not a big deal and will not be limiting to most vapers. The apparent 10 watt limit and relatively low amperage limit is a little more noticeable. Most vapers are satisfied in the 6 to 8 watt range, making the eVic quite adequate, but the limited power keeps it from being considered on par with the Provari or ZMAX. In all, the eVic is definitely worth considering, especially for those new to the electronic cigarette or considering their first APV. It’s a solid device from a company with a solid reputation and looks like it will be available at a reasonable price. The unit tested was purchased from Heaven-Gifts for $104 and of course, a healthy shipping charge. We’ll be anxious to see what they go for from U.S. distributors. edit: Many vendors are now carrying the eVic, including Litecig who has the eVic listed on their site at $104.95 for the kit and MikeUSA who are currently offering 30% off of theirs.